So my current van is a 85 Chevy G20, pretty similar to my previous van but it has windows and was converted by someone else before I bought it. It had a bed across the back, over wheel well boxes he built. This would have been fine, and how I had my bed in the other van, but because the mattress is longer than the van is wide, it had to be squeezed in. The G20 has a window right where this happens though, and it caused the mattress to ooze into the window and skew it. It drove me crazy. 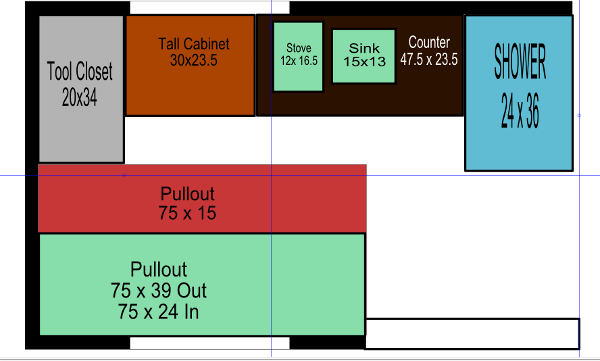 So I started thinking of ways to fix the bed, and I decided i wanted it to sit along the wall between the slider and the rear door, lengthwise. I need to have some storage on the other side, so the bed would be too wide for me to place my gigantic feet, so i wanted to do a pullout 'gaucho' style bed/sofa. Rough plan, there will be many modifications.. But then I had the idea of putting the bed completely away, and using the space as a work area/office. So sat. i set up a frame so the bed will fold up against the wall when not in use. The frame is done and working, just need to cut the mattress down to fit the smaller space it has to go in. Those darn curved walls always get ya in the van. Ill post pictures once i finish getting it all fitted in.